New products that do what existing products do, but (theoretically) better, are not disruptive. They are “sustaining.” Instagram Video is not disrupting Vine. It’s competing with it. The misplaced obsession with low-end disruption, which, as I argued last week, doesn’t apply nearly as strongly to consumer markets. The characterization of obsoletive technology as disruptive. There’s no better example of point number three than phones. The iPhone is a sustaining technology relative to Nokia. In other words, Apple is leaping ahead on the sustaining curve [by building a better phone]. But the prediction of the theory would be that Apple won’t succeed with the iPhone. They’ve launched an innovation that the existing players in the industry are heavily motivated to beat: It’s not [truly] disruptive. History speaks pretty loudly on that, that the probability of success is going to be limited. I regret the inclusion in last week’s article; I was making a rhetorical point that Christensen is consistently wrong about Apple, but this detracted from my overall thesis, specifically, that the mechanics of low-end disruption are much more applicable to business-to-business markets than they are to consumer ones. It certainly is true that touch devices are disrupting laptops, and if you want to say that started with the iPhone, that’s fine. However, I don’t think this is quite right: note that Christensen’s admission never does say what, exactly, happened to cell phones. Of course the easy answer is to say “The iPhone disrupted cell phones.” Except, at least to my reading, that kind of misses the point of what disruption is. In industry after industry, Christensen discovered, the new technologies that had brought the big, established companies to their knees weren’t better or more advanced – they were actually worse. The new products were low-end, dumb, shoddy, and in almost every way inferior. The customers of the big, established companies had no interest in them – why should they? They already had something better. But the new products were usually cheaper and easier to use, and so people or companies who were not rich or sophisticated enough for the old ones started buying the new ones, and there were so many more of the regular people than there were of the rich, sophisticated people that the companies making the new products prospered. Disruption is low-end; a disruptive product is worse than the incumbent technology on the vectors that the incumbent’s customers care about. But, it’s cheaper, and better on other vectors that different customers care about. And, eventually, as the new technology improves, it takes the incumbent’s market. This is not what happened in cell phones. In 2006, the Nokia 1600 was the top-selling phone in the world, and the BlackBerry Pearl the best-selling smartphone.2 Both were only a year away from their doom, but that doom was not a cheaper, less-capable product, but in fact the exact opposite: a far more powerful, and fantastically more expensive product called the iPhone. 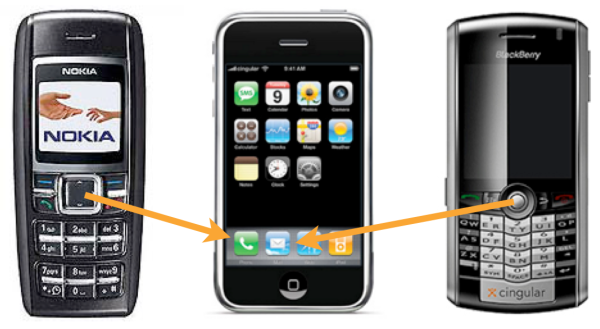 The problem for Nokia and BlackBerry was that their specialties – calling, messaging, and email – were simply apps: one function on a general-purpose computer. A dedicated device that only did calls, or messages, or email, was simply obsolete. Smartphones and app stores have only accelerated this process, obsoleting the point-and-shoot, handheld video games, watches, calculators, maps, and many, many more. Note: This isn’t a new idea by any means. But I think language and word choices are important. Other potential names: subsumative, obviative, absorbative. But not disruptive.